No doubt Gotham is one beautiful font, but with that accolade comes the expected flood of Gotham influenced designs. It’s not really a font you can get bored with, but it can be over used. Did you know that GQ magazine were responsible for the initial commission of the Gotham typeface? Fact via Wikipedia. It’s not just Gotham or Gotham, there are a number of equally stunning fonts that share a similar initial look and feel, not talking identical here. This is not a comprehensive list, it is just limited to the few Gotham alternatives that I have in my own personal font library. There are a number of others out there, but these are the ones I use when I might have used Gotham. Also, these are not meant to be ‘exact or very close’ replicas, each font listed has it’s own unique fingerprint, but share some common aesthetics. The following list of fonts similar to Gotham may entice you to try these out for yourselves. There is also a nice free one at the end of the list. I have used all the following font examples in various logo designs in my logo portfolio, and tend to buy just the few weights I need, rather than the whole family. This is a great way to increase your own font library without really breaking the bank. The images link direct to the Foundry where possible, where you can look and test the fonts out. 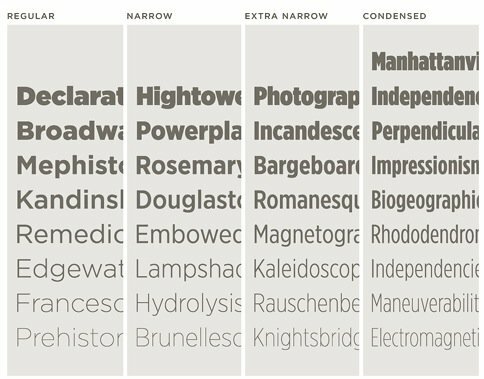 A particular favourite is Effra from DaltonMaag, but I found myself using that more than I did Gotham, hence my search to find some other similar fonts. If you have any suggestions of your own, please do share in the comments below, preferably with a link to where we can check it out. MuseoSans 500 & 500 Italic free to download. Nevis is free to download, one weight only.